Decision making is a key competency of surgeons; however, how best to assess decisions and decision makers is not clearly established. The aim of the present study was to identify criteria that inform judgments about surgical trainees’ decision-making skills. 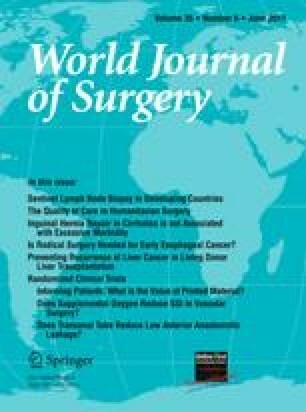 A qualitative free text web-based survey was distributed to recognized international experts in Surgery, Medical Education, and Cognitive Research. Half the participants were asked to identify features of good decisions, characteristics of good decision makers, and essential factors for developing good decision-making skills. The other half were asked to consider these areas in relation to poor decision making. Template analysis of free text responses was performed. Twenty-nine (52%) experts responded to the survey, identifying 13 categories for judging a decision and 14 for judging a decision maker. Twelve features/characteristics overlapped (considered, informed, well timed, aware of limitations, communicated, knowledgeable, collaborative, patient-focused, flexible, able to act on the decision, evidence-based, and coherent). Fifteen categories were generated for essential factors leading to development of decision-making skills that fall into three major themes (personal qualities, training, and culture). The categories compiled from the perspectives of good/poor were predominantly the inverse of each other; however, the weighting given to some categories varied. This study provides criteria described by experts when considering surgical decisions, decision makers, and development of decision-making skills. It proposes a working definition of a good decision maker. Understanding these criteria will enable clinical teachers to better recognize and encourage good decision-making skills and identify poor decision-making skills for remediation. The results of this study formed part of a presentation given at the Royal Australasian College of Surgeons Annual Scientific Congress, 9 May 2009, and an abstract was published in the Australian New Zealand Journal of Surgery. The authors are grateful to Research Professor Peter Herbison, MSc (Otago), biostatistician, for advice regarding statistics and undertaking some of the statistical analysis. Also thanks are due to all the international experts who gave their time to complete the survey. The study was designed by Sarah C. Rennie with the guidance of Andre M. van Rij. Sarah C. Rennie delivered the study and collected the data, and, with Katherine H. Hall, undertook the data analysis. All authors were involved in the interpretation of the data. Sarah C. Rennie wrote the first draft of the paper; all authors contributed to the various drafts and approved the final version for submission. Andre M. van Rij is the guarantor.